New Zealand has traditionally been credited with three endemic avian families: kiwis, New Zealand wrens, and New Zealand wattlebirds. Molecular evidence has just revealed another: Stitchbird, often locally called the Hihi (left, in a great photo by Trevor Quested). The species had previously been considered one of three honeyeaters on New Zealand. The DNA evidence shows that the other two (Tui, Bellbird) are, indeed, honeyeaters but Stitchbird is not (Driskell et al. 2007). Rather, Stitchbird is from an ancient relict line whose closest relations are New Zealand wattlebirds. But Stitchbird diverged from wattlebirds ~33.8 million years ago. Thus the appropriate taxonomic placement is in its own family, the Notiomystidae (Driskell et al. 2007). Stitchbird is entirely endemic to North Island and surrounding islets, New Zealand. It is a forest species, somewhat nomadic and forming loose groupings of adults and youngsters. These feed primarily on nectar and fruits, when available, but also take some invertebrates gleaned from foliage and bark (Heather & Robertson 1996). It may need substantial expanses of native forest to survive (Armstrong et al. 1999, Birdlife International 2000). Stitchbird was once common, especially in the southern parts of North Island, until the 1870s. Thereafter it declined rapidly. By 1885 it had vanished from the mainland of North Island, plus from the offshore Great Barrier and Kapiti Islands (Heather & Robertson 1996). The cause of the rapid decline was habitat loss, and the introduction of non-native predators such as rats, cats, and stoats. From 1885 to 1980, they survived only on Little Barrier Island. Recent estimates from Little Barrier are just 500 to 2000 birds (Birdlife International 2000). Attempts were make to re-establish former populations on other offshore islands, including Hen, Cuvier, Kapiti, Tiritiri Matangi and Mokoia Islands. The early efforts, in the 1980s, were not successful (i.e., on Hen and Cuvier Islands) but populations did gain a toe-hold on Kapiti, Tiritiri Matangi, and Mokoia Islands. These were established between 1991–1995 (Armstrong et al. 1999, Birdlife International 2000). Food shortages, translocation methods, and extent of habitat may be important limiting factors in re-establishing the species on some islands (Armstrong et al. 1999). Populations have done particularly well on Tiritiri Matangi, where each individual is banded (see photo) and tracked. My visit there was in Dec 1997, when we learned that 37 birds had been released in 1995. They initially declined but rallied, and at that time there were 17 breeding pairs that had fledged 14 young that austral spring. We saw a number of adults and youngsters,* a good number of whom were concentrated around feeding stations within the native forest. By December 2004, The Tiritiri Matangi website (checked today, in July 2007) gave the population as "over 100" on the island, and said to be 3000 altogether (including those held in zoos for captive breeding). That website still listed Stitchbird as a honeyeater, and stated that "The stitchbird is the lowest in the pecking order of the three honeyeaters and will only be permitted to feed on low-grade sources of nectar when the tui and bellbird are also present. On Tiritiri Matangi their diet is supplemented with nectar water placed in feeding stations located in areas frequented by stitchbirds." The population on Tiritiri Matangi has since done so well that 64 individuals were translocated from Tiritiri Matangi into the Karori Wildlife Sanctuary in 2005. This was the first effort to establish a wild population on the North Island mainland in 120 years. The birds began breeding and the population had doubled by the end of 2005. There are plans for other North Island mainland introductions elsewhere. It is anticipated that the discovery that Stitchbird represents a relict, family–level endemic will "assist policy determinations for the conservation of this rare bird" (Driskell et al. 2007). Photos: Trevor Quested photographed the Stitchbird Notiomystis cincta at Tiritiri Matangi Island, New Zealand, in Oct 2004. Photo © 2007 Trevor Quested, used with permission; all rights reserved. Bibliographic note: There is no "family book" per se, as this was always assumed to be a honeyeater. Standard information is in the New Zealand literature, including field guides (e.g., Heather & Robertson 1996). Armstrong, D.P., I. Castro, J.C Alley, B. Feenstra, and J.K. Perrot. 1999. 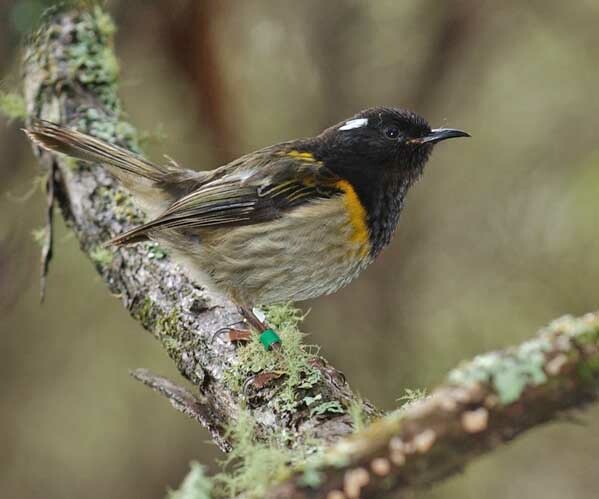 Mortality and behaviour of hihi, an endangered New Zealand honeyeater, in the establishment phase following translocation. Biol. Conserv. 89: 329-339. Birdlife International. 2000. Threatened Birds of the World. Lynx Edicions, Barcelona. Heather, B.D., and H.A. Robertson. 1996. The Field Guide to the Birds of New Zealand. Penguin Books, Auckland, N.Z. * = from a world listing standpoint, it has long been my position that the 'countability' of re-introduced native birds into their former native habitat is not bound by the (properly) strict criteria that governs the 'countability' of introduced non-native species. In short, native birds are "good" while non-native exotics are "bad" and often negatively impact native populations. One welcomes re-introduced native birds (locally for me, that includes California Condor) while wishing that dangerous exotics (e.g., E. Starling) be discouraged (although I strongly believe that observers should study and keep track of populations of both native and non-native birds, rather than ignoring exotics). Among the many ways to discourage the introduction or maintenance of exotics is to make it easy for birders to 'count' native re-introduced birds but very difficult to 'count' non-natives. As many of today's strong conservation leaders began as birding 'listers,' this approach teaches useful lessons. The approach is actually adopted in practice by the vast majority of birders, although it is rarely expressed in these terms. While I agree that a zoo-hatched native bird is not 'countable' even after its release e.g., (the American Birding Association rule that zoo birds are not 'countable') it is entirely proper that the wild born youngsters of re-introduced native species are 'countable.' Thus, on Tiritiri, it was important to us to see young birds in the wild. We succeeded with Stitchbird, New Zealand Robin, Saddleback, and Takahe, but saw only released adults of Brown Teal (the young of the pair had been taken by a predator). The Stitchbird, Robin, Saddleback and Takahe were 'counted' as lifers, but the Brown Teal was not. We traveled many hours farther north to see 'countable' Brown Teal.